Uncle Kenny’s BBQ was started by two college friends from Missouri, the BBQ capital of the world. 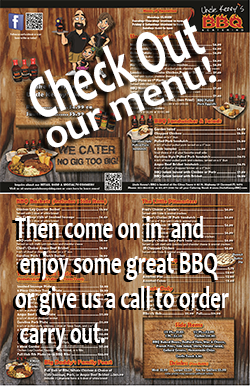 Uncle Kenny’s BBQ is a family run businessthat prides itself on cooking some of the best barbeque around. Mike Smith and I (Uncle Kenny Nadeau), first met in Missouri where we learned to appreciate the intricacies and flavors of smoking and curing meats. Eventually both Mike and I moved to Florida, and enjoyed barbequing for family and friends in the Florida sun. After loads of encouragement, and prompting from family and friends, we started Uncle Kenny’s BBQ in 2004. With the help and support of our wives we started catering private events and festivals. A year later we decided to start testing our skills against the best in the area. Uncle Kenny’s participates in BBQ competitions sanctioned under the Florida Barbeque Association (FBA) and Kansas City Barbeque Society (KCBS). When it comes to great barbecue, Uncle Kenny’s BBQ brings the world renowned flavors of Midwest style. Whether it’s chicken, ribs, pork, or brisket, we slow cook with oak and use several spices in our dry rub for those great Midwest flavors. We also make our own sweet and spicy sauce that has that great sweet taste with a little zip. We pride ourselves on using only the finest ingredients, which result in the finest barbecue. So if you’re looking for great barbecue without all the work call Uncle Kenny’s BBQ to cater you next event (No Gig Too Big). Join our Cooking Class mailing list by clicking here.